The 2011 higher elevation hiking season is fading very quickly. We had a very late start to summer and LOTS of late season snow, so it was mid-late July before some of the higher elevation trails were accessible. Here is it the beginning of October and fall and its rain (and soon snow) is quickly arriving. Snow at 4500 feet is supposed to be coming this week. While I couldn’t get out on Saturday, I wanted to try and do a short hike on Sunday. 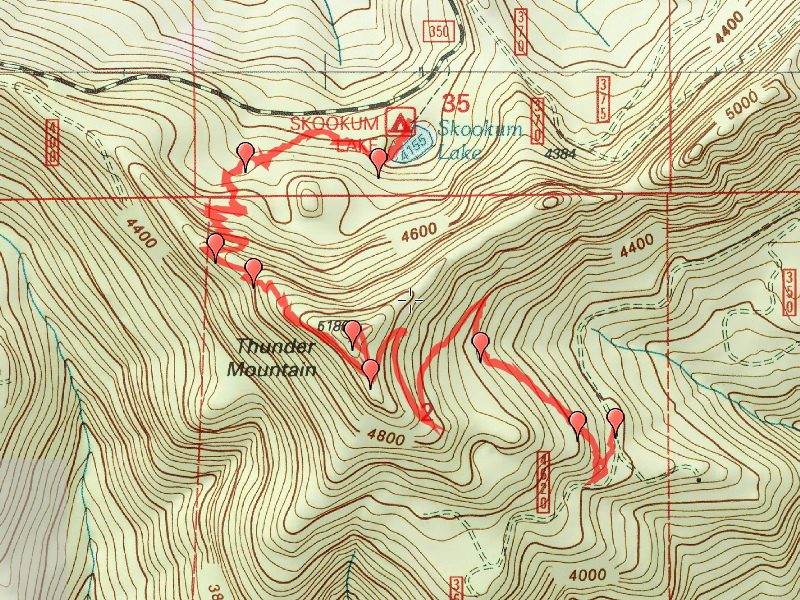 I opted to hike the Thunder Mountain and Skookum lake trails. These were supposed to be 1 mile trails (each), so I had expected to do about 4 miles total. An easy Sunday afternoon. Well, the trail sheets were off a bit. The trails are more like a mile and a half (one way), so I ended up hiking a little more than 6 miles. Still easily do-able on a Sunday afternoon. Got to the trailhead about 12:40 and started up the trail. On the way in, 3 does got scared by my truck and they RAN (more like jumped) down the road. This was the start of deer season. The beginning of the trail starts at an old spur road and the trail is a little rough. There are spots that are VERY overgrown with Thimbleberries, but thankfully they are not too long. For some reason, I get the beginning of this trail confused with the begining of the Whetstone trail. Once past the rough spots, the trail takes off through pretty much untouched forest, which is stunning. The trail does gain a fair amount of elevation, but for the most part, isn’t too bad. A few brushy spots along the way, too. There are a couple of really nice viewpoints on the way up, but today was just fog and clouds. Once almost to the top, the Skookum lake trail joins. We took the trail to the summit and the location of the old lookout. Not a lot to see on this day – we were hiking through clouds/fog and on top there were lots of low clouds, so couldn’t see too much. I was hoping we might get another view of the Motherlode fire, but there were too many clouds. Back down the trail to the junction with the Skookum lake trail, and down through the burned area to the lake. The last time I hiked this trail, the fire had just occurred and the trail was very difficult to follow due to damage from the fire. That has all been fixed, and the trail is pretty easy to follow – someone had recently flagged a bunch of the lower section where it gets a little brushy in places. I had forgotten how much elevation you lost on the way down to the lake – you lose almost 900′ of elevation going down to the lake. So, you start out, go up to the lookout and then come down to almost the same elevation you started at, and then have to come back up all that elevation. Once at the lake, we stayed fora little bit, took a couple of pictures and then started back. I did a little brush work on the way back up. It gave me a chance to catch my breath as we were making our way back up. Bodie didn’t care – he was ready to go! The trip back was uneventful. The views were a little better on the way back, but you could tell that the rainy weather was blowing in. Where the trail is exposed on the west side, it was pretty breezy. I think that was the weather system coming in. As I didn’t want to get caught in a downpour, I decided to try and pick up the pace a bit. I was already pretty soaked from all the wet brush, but didn’t really want to get rained on, too. Made it back to the truck by about 4:15. A nice cloudy/foggy/cool day in the woods along some beautiful trail.